Every school system has students whose disabilities, mental health needs, or behavioral issues are intense or unique enough that they need to attend school in a segregated facility. Often, this is to ensure the student’s safety — and sometimes to safeguard others. In the worst settings, it can be a one-way trip for a disruptive student the system has given up on, who will mark time in a prison-like setting until dropping out. But sometimes, it’s a transformative juncture, where a student is exposed to adults who’ve been there and doesn’t have to put on a “normal” face in a regular classroom. Educators don’t talk a lot about these schools, out of concern for student privacy, and also out of a sense that swaths of the public will see the herculean lift often required to meet these children’s needs as throwing good tax dollars after bad. When Superintendent Pedro Martinez arrived at the San Antonio Independent School District three years ago, he was struck by how little support was available to the 50,000-student district’s small and fluctuating population of kids with severe emotional and behavioral disorders. Treatment options for young people were so scarce that Bexar County, which is home to San Antonio ISD and the 16 other school districts within the city limits, had a 12-year waiting list for services, special education staff told him. Absent those, reality was that San Antonio ISD’s schools were frequently the only place where these students got help. What the city did have was a 20-year-old nonprofit that operates charter schools in residential facilities, including juvenile detention centers, facilities for teens in foster care, and treatment programs, as well as a private school in an Immigration and Customs Enforcement center for mothers and children seeking asylum. The organization, Braination, also runs a school on the city’s far northwest side that could not appear, at least at first, more different from its residential schools. An architectural gem where students can study subjects of their own choosing in a giant treehouse, Anne Frank Inspire Academy uses an online platform developed for community colleges in Norway. Its curricular model, called guided inquiry, is copied from the vaunted International School of Brussels. Like most public charter schools, it admits students by lottery. As Martinez and his team strategized how to improve student outcomes for as many students as possible on an ambitious timeline, they took advantage of untapped expertise both among the district’s staff, some of whom were invited to open innovative new schools, and within outside organizations. The Relay Graduate School of Education, for instance, was asked to convert two low-performing schools to teacher-training labs and then to run them. 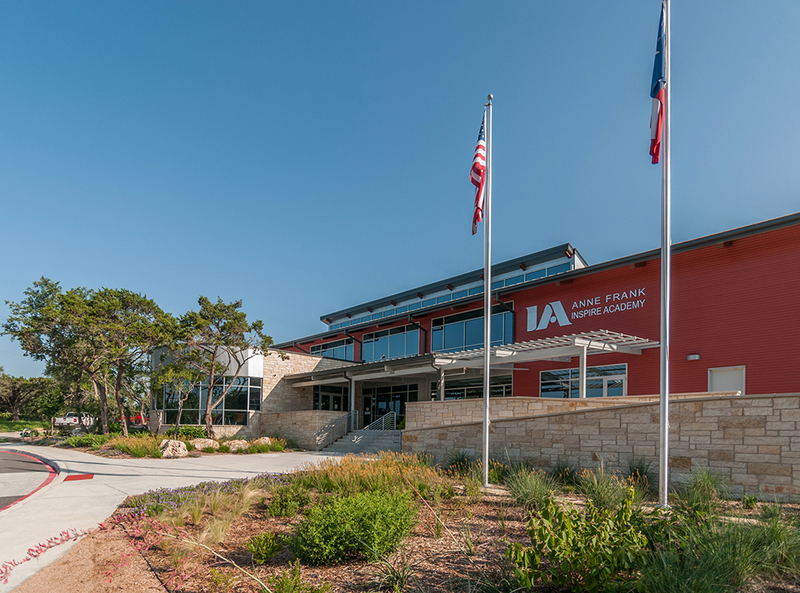 Opened in 2014, Anne Frank Inspire was the kind of exciting and innovative school San Antonio ISD was struggling to compete with for students. Yet its parent organization, Braination, also had the specialized expertise to support students many traditional districts write off. Some of its success is attributable to the nonprofit’s willingness to encourage synergy between its residential schools and Anne Frank Inspire’s cutting-edge campuses. Martinez heard about Braination shortly after his 2015 arrival and reached out to see whether the organization would consider partnering to run one of his schools. San Antonio ISD would provide the building, transportation, food, and oversight mandated by special education laws. Braination, the nonprofit with the network of specialized charter schools, would supply teachers, paraprofessionals, nurses, counselors — and expertise. In August 2017, the district’s Brewer Academy opened its doors to middle and high school students with mental health struggles and serious behavioral challenges. District leaders say state officials told them the arrangement was Texas’s first charter-district partnership in special education. As with other alternative programs for students who need time away from general education settings, Brewer’s goal is to prepare students to go back to their home schools, located throughout San Antonio ISD, and be successful. Entering its second year, the partnership appears to be working. Suspensions at the alternative campus have plummeted, and Martinez says feedback from families is positive. San Antonio ISD’s special education director said her counterparts from other districts are visiting, wanting to learn more about their creative approach to an always-challenging population of students. Perhaps most encouraging, when Texas released 2018 school performance data, Brewer Academy met state learning targets, albeit using alternative standards. A former classroom teacher, Braination founder Bruce Rockstroh has spent 30 years working in schools at detention centers and residential facilities. About a decade ago, he started dreaming about perhaps doing himself out of a job by creating a school where the cascading failures that often push students into the school-to-prison pipeline don’t happen. He’d gotten good at connecting with the toughest kids but was frustrated at his inability to truly capitalize on those connections. In the three or so months he’d have his teen students’ captive attention, he could help them catch up. Maybe patch some holes in their high school transcript. Better, obviously, to start before those dismal statistics take hold. When Rockstroh started thinking about this, he was struck by how many students made it to ninth grade already too far behind to keep up and earn credits toward graduation. So he decided to open a middle school. 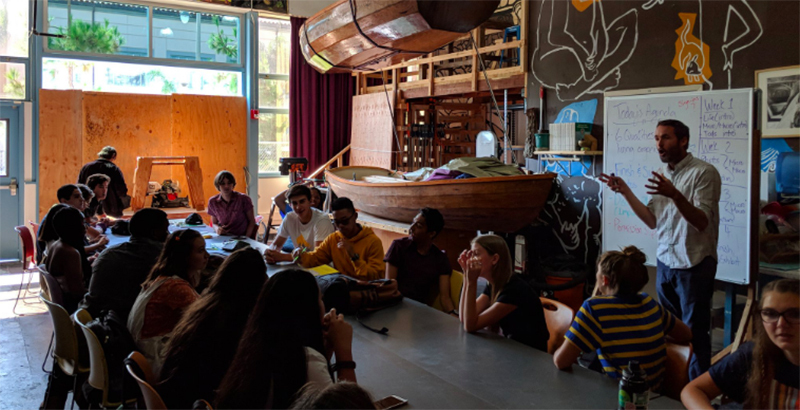 As he developed a plan, Rockstroh kept hearing about guided inquiry, a form of personalized learning used by high-profile innovative schools like San Diego’s High Tech High and Minnesota’s New Visions. Students use technology to investigate their curiosities, checking in with teachers as they go. If this level of freedom seems 180 degrees from the rigid structure of many residential educational settings, to Rockstroh it made immediate and intuitive sense that the model held promise for engaging both general education students and those who may have forgotten there can be anything engaging about school. The human brain is hardwired for learning, he continues, so why not start with a topic that captures a young person’s attention? If all students benefit from subject matter that’s tailored to their interests, for students in secure facilities, it might be an even bigger catalyst. About the same time he was dreaming about a new school, Rockstroh, who is an architecture buff, started building a lake house — not just any lake house, but one based on blueprints drawn by Sarah Susanka, author of The Not So Big House. Construction completed, Rockstroh was extolling his new house’s joys to a former colleague, an architect who had spent 10 years renovating schools, only to end up frustrated. Instead of retrofitting theories of learning to work in outdated buildings, Prakash Nair had concluded that schools needed to be built to suit their educational models. Rockstroh’s idea for a new school, the two decided, needed a completely original kind of setting. Fast-forward a few years, and the school that was born of that conversation, the Anne Frank Inspire Academy, is physically and visually distinct from Braination’s other schools. Separated from a commercial thoroughfare by an artificial berm and a lush stand of trees, the campus at every turn feels wide open to the Texas Hill Country. A broad front porch is shaded by a stainless-steel pergola that ushers visitors inside into a great hall known as the plaza, the gathering space traditionally at the heart of any Spanish colonial-era city. Two stories of glass enclose the space, where middle school students work alone or in groups on projects that have caught their attention. On one end, windows frame a floor-to-ceiling panel of polished cross-cut segments of trees cut down to build the school. On the other end, a wooden lattice frames a second-story study nook known as the nest. Across the plaza, a large screen porch looks out on a pond, a creek, and winding paths that connect the main building to similarly open elementary and high school buildings that share the same charter school campus. There’s a garden shed and workshop and, cradled high in the branches of a 200-year-old oak, a treehouse built by the host of Animal Planet’s Treehouse Masters, Pete Nelson. The openness is intentional, a carefully thought-out step away from the “cells and bells” model of education, in which teachers stand at the head of enclosed classrooms, instructing students lined up in rows of desks. Here, students are posed questions — sometimes involving a real-life issue in their school or community, or in a social or scientific arena — and asked to explain how they arrive at their answers. Technology, he continues, has made it easy to find information. But schools still give short shrift to teaching the ability to analyze it. Anne Frank Inspire’s grounds are wired for the internet— and a discreet security system — so students can work on projects in a media lab or other breakout room or one of eight outdoor work spaces. There’s little need for classrooms when students work at their own pace, seeking out teachers when they feel the need. The first Anne Frank Inspire building, the middle school, cost nearly $6 million to build, much of which came from the charter school district’s reserve fund. Texas makes very little facilities funding available to charter schools. The elementary and high schools cost half as much, partly because designers worked with cheaper materials, such as standard windows versus custom ones, and partly because the big expenses involved in extending infrastructure like sewers and electric service to what had been farmland came out of the middle-school construction budget. Anne Frank Inspire’s 17,000-square-foot middle school opened in August 2014, followed by an elementary school and, finally, in the fall of 2016, a high school. Each school enrolls 150 students who run the socioeconomic gamut, from families who live in the surrounding wealthy neighborhoods to kids who commute from less prosperous parts of the city. So how, with no treehouse to retreat to, students often enrolled for just a few weeks or months, and with more cells and bells than the most rigid school, do the residential charter schools push toward a goal of two months’ worth of academic growth for every month present? By borrowing a tactic developed by a Harvard business school, the balanced scorecard which, in a secure facility, Rockstroh likens to a four-lane highway. One lane is an assessment of where a student is and what an appropriate goal is. Another is remediation, instruction in missing literacy and math skills. A third lane is the student’s plan, the topics into which they would like to inquire. And the fourth is a “passing lane,” in which a student who’s zoomed past their goals can keep going. Progress is assessed every 30 days. Some kids get into the passing lane and stay there. Hopefully, every victory will help make students happy to go back to regular school, rather than angry or anxious. “If we can help a kid fall back in love with learning, that’s a big thing,” says Rockstroh. The strategy immediately resonated with San Antonio ISD’s Beth Jones, the district’s senior executive director of special education. A student can struggle with severe anxiety or have a diagnosis of schizophrenia, she notes, and be both a year or two behind and just as smart as any other student. The first thing Braination asked the district to do when the two organizations started discussing a partnership was move its segregated program out of the beautiful and historic building it had been in, Pickett Academy, which had a problematic lack of sight lines and lacked rooms for therapy and outdoor space. They moved it to a mothballed school on the city’s west side, Brewer Academy, added art therapy, Jones says, and started holding open houses for families, virtually unheard of in a secure setting. The facility has the capacity to serve 60 students, but enrollment fluctuates according to need. The results were immediate. For the first three months of the 2017-18 school year, suspensions from the program fell 41 percent from the previous year, according to Jones. Because federal law requires schools to serve special education students in general education settings as much of the time as possible, the goal is to return Brewer students to their home schools. Which is an arena where being part of a traditional district has an advantage over standalone alternative programs, like the ones Braination runs in other settings. When a student is ready to go back to a regular school, Brewer staff try to position them to do well. They try to arrange for students to be placed first in their strongest subjects. “Then we add classes that are harder,” says Jones, “so by the time it gets challenging, you have some confidence.” Others graduate, either from their home school or from Brewer. The partnership has attracted attention from other districts struggling to serve students with emotional and behavioral disabilities. Jones credits Martinez for pushing the adults in the system to dream big for their students. Video Credits: Produced by Heather Martino, Edited and Directed by James Fields | Disclosure: The George W. Brackenridge Foundation provided financial support for this project to The 74.